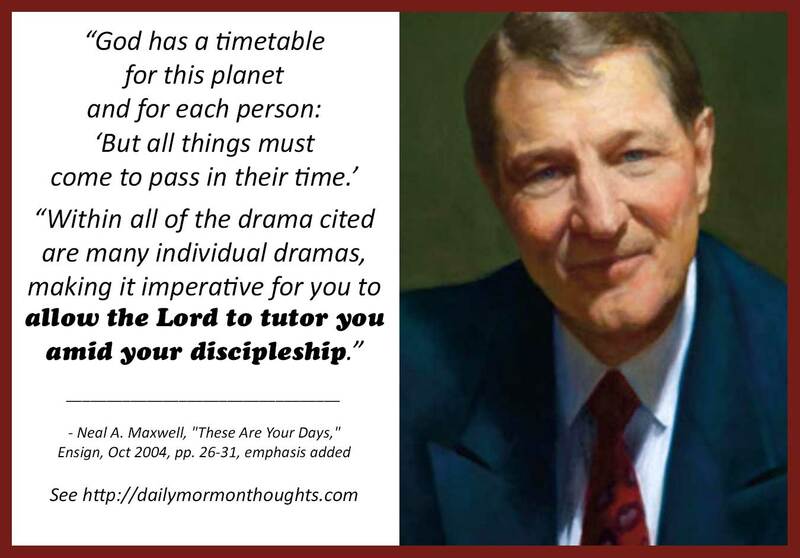 This excerpt is from an article that was being prepared for publication when Elder Maxwell passed away. "God has a timetable for this planet and for each person: 'But all things must come to pass in their time' (D&C 64:32). "Within all of the drama cited are many individual dramas, making it imperative for you to allow the Lord to tutor you amid your discipleship. "Enoch rejoiced, and so can you over the grand, consoling reality regarding God: 'And yet thou art there' (Moses 7:30). Privileged Enoch even saw the God of heaven weep! (see Moses 7:29). Yet Enoch was very discouraged by the gross wickedness anciently. He said he would 'refuse to be comforted' (Moses 7:44). The mentoring Lord, however, told Enoch to 'lift up your heart, and be glad; and look' (Moses 7:44). Then revealed to Enoch was Jesus' Atonement in the meridian of time and also the latter-day Restoration. Enoch, who had been so distraught, now rejoiced! "Do not 'refuse to be comforted.' Let the revelations comfort you. Let the scriptures refresh you!" 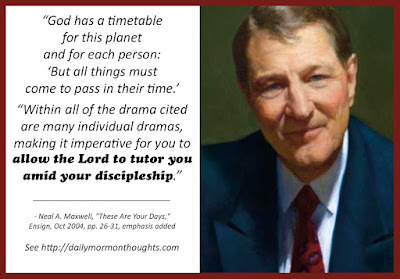 "God has a timetable"—those words reflect and understanding of eternal purpose and divine control. If we truly believe that, then it truly does become critical to "allow the Lord to tutor you amid your discipleship." With that faith and hope, we can, like Enoch, learn to lift our hearts in gladness in spite of wickedness around us, or personal trials and challenges. 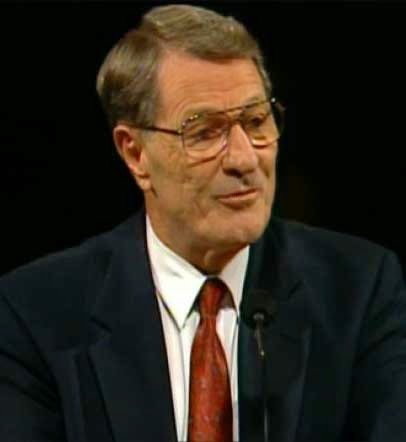 And a great key to finding comfort amidst those challenges of mortality, according to Elder Maxwell, is to turn to the revelations and the scriptures. That will enable God to speak to us, as He did to Enoch; the reassurance will come.